Rifle now offers a replacement windshield for the Victory Mini Standard Windshield for Hammer's, Kingpin's, Jackpot's and the Vegas. 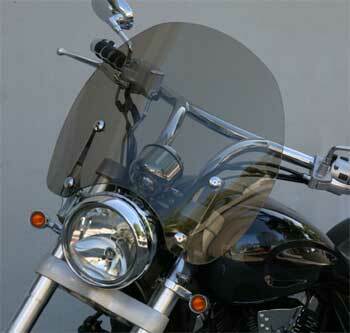 The Rifle Replacement Windshield for the Victory Mini Standard Windshield is 19" wide at the widest point and and is available in 3 sizes; 16" (stock height), 18" (+2") and 20" (+4"). Height is measured from the top of the headlight. You can also replace the OEM windshield with one of our 3 tint options as well as clear. Rifle can also build custom sizes to your specifications. Made of D.O.T. approved Lucite® for better clarity and scratch resistance. Comes pre-drilled for easy installation into your existing hardware. Windshield Size: Standard (stock size 16" high, 19" wide), 2", or 4" taller. Compatibility: Victory part number(s): 2875581, 2872937.